Leo and Kate–together again! For those emotionally trigger-happy TITANIC fans who thought REVOLUTIONARY ROAD would be a reteaming of their favorite star-crossed lovers to recapture lachrymose memories (like the manipulative reteaming of Hanks and Ryan time and again to retread the same mindless romcom ground), this movie’s first scene should dispel any of those flighty notions: Leo and Kate as husband and wife at each other’s throats, arguing like the best of us in real life, their confrontation almost degenerating to physical violence. Tonally diametrically opposite to their weeping willow roles onboard the RMS Titanic, we meet the marriage-challenged Frank and April Wheeler (DiCaprio and Winslet) in 1950’s Connecticut, living in an average Middle American suburb on Revolutionary Road, her dreams of being a successful actress slowly dying in cruddy stage plays, his dreams of migrating to Paris being quashed by financial reality. I must admit to initially bracing myself to cringe throughout REVOLUTIONARY ROAD, expecting implausible promises of eternal love wafting like indiscriminate farts across a landscape of painfully pretty pusses. But we soon realize this is not a lank romantic excursion into platitude land. This is what would have happened had Jack and Rose lived to kiss dry land. Whereas marriage and settling down is usually regarded as the goal that young couples strive towards, when this couple achieves that goal they realize it is more nightmare than dream. In movies made in the 1950s, all those innocent, soft-focused American 35-year-old “young lovers” tilted at nothing else, because all the entertainment media, the church and the agrarian communities were spinning the state of marriage stagnation as THE goal. But Frank and April are constantly trying to find ways out of this endgame. Because they’re bored. Because they’re human. 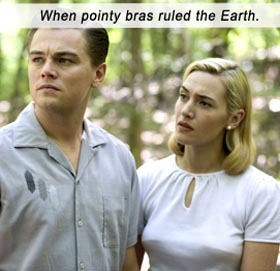 Is REVOLUTIONARY ROAD the first “1950’s revisionist” romantic movie? From the 1961 novel by Richard Yates (screenplayed by Justin Haythe, directed by Sam Mendes), Frank and April could be the first realistically portrayed couple of the 1950s since American movie-making began! Leo and Kate pull out all the stops with nerve-raw performances that make us wonder how they ever came out of this as friends. For every LEAVE IT TO BEAVER household in the nostalgic ’50s, surely there must have been perceptive, questing humans like Frank and April, who felt there was more to the quality of life than obeisance to the repressive Industrial Age existence foisted upon them; their quiet desperation inciting them to rebel against the contrived conventions of BEAVER-type propaganda. And Hugh Beaumont. April even rages quite explicitly, “Look at us – we’re just like everyone else! We bought into the same ridiculous delusion – this idea that you have to resign from life and settle down…” She considers her life a derailing of dreams, rather than acquiring of them. And Frank and April’s arguments do not spring from soap opera templates – they arise out of nowhere, as in real life, they go nowhere, as in real life, each protagonist just trying to convince the other to selfishly follow their course, as in real life. The couple’s best laid plans are waylaid by pregnancy, by jobs, by affairs, by differing ideals of happiness. Kathy Bates (who co-starred with DiCaprio and Winslet in TITANIC as an annoying old lady) co-stars with DiCaprio and Winslet as an annoying old lady. She foists her mentally-unbalanced son (Michael Shannon) on the couple, but he turns out to be just a person with no verbal inhibitions (in other words, truthful – what “civilized” society cannot comprehend, so deems unbalanced), who becomes a loudmouth conscience for the couple. The nuclear family ideal is so ingrained in Middle American culture that when Frank and April tell their neighbors they are planning to move to Paris, with April supporting the family instead of Frank, they cannot process the information. They are so inculcated by societal strictures that outwardly they smile and say “That’s nice!” while in private they dismiss Frank and April as lunatics. Wait till Hugh Beaumont hears about this! Writer: Justin Haythe, Richard Yates. Starring: Leonardo DiCaprio, Kate Winslet, Kathy Bates, Richard Easton, Kathryn Hahn, Zoe Kazan, Dylan Baker, Jay O. Sanders, Michael Shannon.